Everyone wants to have good relationships, right? Unfortunately, most people don't have a clue about how to create a good relationship. We fumble around over and over again, trying to get it right and it seems like a losing battle a lot of the time. We were taught by our parents, or the people in our early years, that we need to behave in a particular way, and that would please them. However, It was not necessarily what was right for us. It was more likely that we were guided to do what made those grown ups feel better. This probably didn't made any sense to us. It may not have made sense to those who were creating the rules. But, we modified our behavior to accommodate others. Whatever the messages were, we fashioned ourselves through those lenses. We learned at an early age to please others and that it was selfish to please ourselves. As little ones, we loved to see the smiles and feel the love of our parents. When we acted in a way that resulted in a harsh look or word, we wanted to do almost anything to get the happy feeling back. We started to twist ourselves into all kinds of different shapes to keep getting the love that we so desired. The pressure to be different than who we are can be overwhelming. As small children, many of us lose our way. We want, or need, to please our parents so much that we disconnect from our true selves and don't know it. It's like the frog in the boiling water syndrome. The premise is that if a frog is placed in boiling water, it will jump out. But if it's placed in cold water that is slowly heated, it will not perceive the danger and will be cooked to death. The frog doesn't know it's going to lose its life because it has gotten so used to the feeling of being hot. We can be like that in the respect that we can unconsciously do things that don't resonate with who we really are. We may find ourselves having no boundaries, not having any idea of what we truly want and definitely having no idea how to change this. After lots of education, therapy, trainings of all sorts and a LOT of relationship experience, here are a few thing that I know. The most important thing about being in a healthy relationship is that you first and foremost, be connected to your Self. That means your Divine Self, your Higher Self, that part of you that is still connected to Source. That means that you love yourself above everything else. You are kind and gentle to yourself. You value your feelings and thoughts. There's a lot more to number one. Another way to say it is, you need to be selfish. I know that's a rough word. I like to say self loving instead of selfish. Again, many of us were taught that when we were selfish we were "bad." That actually meant that we actually were not doing what someone else wanted us to do. So let's take that back. Let's know that the best thing we can do for anyone, including ourselves is to be self-loving. You have to love yourself before you can really love another. Each one of us needs to be able to stand on our own two feet before we can become a good partner. The first premise I introduce when I do Relationship Coaching is this. It surprises people at first and after a short while, they begin to understand the truth of it. Don't try to "make" someone happy. Your job is to make you happy. The other person's job is to do the same - to make themselves happy. Or better said, to find ways to be happy. When each person is responsible for their own feelings, the pressure to "do" for another is removed. If you're not happy with yourself, finding someone else isn't going to solve that problem. People are like energetic magnets. Think about the saying, "Birds of a feather flock together." That's exactly what happens. What we put out comes back. So if you want a different kind of partner you have to change yourself from the inside out. 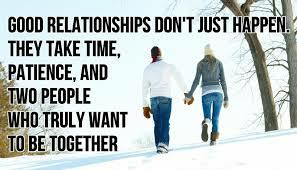 It's true that good relationships don't just happen. Not only do they take patience, a desire to be together and commitment, they need good communication skills. That's a whole other blog! One tip I can offer is that it's very important to express your feelings, not your assumptions or blaming statements. Don't use "you" statements. They totally alienate the person you're speaking with (or to). When you say how you feel, the other person can't really argue with you about whether that's right or wrong. But if you put the blame on them, their primary response it to become defensive. After all, wouldn't you? So try to slow things down. Breathe more. Take space for yourself. Love more. Love yourself more. Don't empathize with your partner. If they are in a bad space and you are not, don't go there with them. It's like what they tell the life guards. Don't let the drowning person drown you too. People often think they have to lower their vibration to match where another's is. You may think that you'll hurt the other person's feelings. In reality, if you do that you no longer can be the light that will help show the way to a better feeling place. Don't let another person be the cause of you feeling like you have to join them in their misery. That will only cause two of you to feel bad. How helpful is that? Relationships don't just happen. They need time. They need nourishment. They need tending to. They need fun. Please don't forget about the fun factor! They need practice and compassion. And the commitment to love yourself above all else. Don't take this all too seriously. It can be easy. It needs to be fun! You can do this. And if you get stuck, you can count on me to help!